DENVER – On Wednesday morning, Jeanette Vizguerra was scheduled to show up for a check-in at the local office of the U.S. Immigration and Customs Service. Instead, Vizguerra, a 45-year-old undocumented immigrant from Mexico, sent her attorney to request a stay of her deportation. As Hans Meyer entered the low-slung brown brick building, a pastor by his side, scores of protesters waving signs shouted "No hate, no fear. Immigrants are welcome here." A few minutes later, Meyer returned. Vizguerra's request had been denied. Then an activist put Vizguerra on speakerphone and held it up to a megaphone and, her voice choking with tears, the mother of four delivered her announcement to the crowd: Vizguerra had decided to seek sanctuary 15 miles away in a makeshift bedroom in the basement of First Unitarian Society of Denver. There, she would remain indefinitely. "This is not the end. . . This is just a step in a long, long journey," she declared in Spanish. ICE public affairs officer Shawn Neudauer affirmed in an email that Vizguerra was denied a stay of her deportation. She called her "an ICE enforcement priority" based on two misdemeanor convictions. Propelled by President Donald Trump's anti-immigrant rhetoric during the campaign and the election in November, the number of churches and other houses of worship that have declared themselves sanctuaries for undocumented immigrants like Vizguerra has doubled to an estimated 800 over the past year, according to leaders of the loosely knit movement. Trump's Jan. 25 executive order calling for a crackdown on the estimated 11 million immigrants living here illegally and the raids that have followed are only serving to galvanize the movement further. Last week, ICE agents arrested more than 600 people in at least six states. Officials said the raids have targeted known criminals, but they also detained some immigrants without criminal records, in an apparent departure from the Obama administration's policy. Trump's order extended the scope of enforcement to include those with minor offenses or no convictions at all. In Arizona last week, a woman was deported after checking-in with ICE – just as Vizguerra was supposed to do on Wednesday. Twelve years after crossing the border, Vizguerra was pulled over in 2009 for a traffic violation and convicted of falsifying a Social Security number, which she said she planned to use to secure a part-time job. Her case eventually led to an order of deportation. Vizguerra said she has been granted five stays during which she has been required to check in with ICE, although ICE officials say the agency has granted her six stays of removal. Last year Vizguerra, whose husband had been convicted of assaulting her years earlier, applied for a U Visa granted to crime victims, which would waive her removal order and give her a three-year visa. That application is still pending. In December, she requested another stay but has not yet received a decision. Her latest stay expired on Feb. 7. Now, ICE knows exactly where to find Vizguerra. The question is whether they will enter a church to retrieve her. The current church sanctuary movement in the U.S. began to take shape about 10 years ago, inspired by a 1980s effort that provided shelter to thousands fleeing to the U.S. from civil war in Central American countries, said movement co-founder Alexia Salvatierra, a Lutheran pastor and an immigration-rights activist. Under Obama, ICE pursued a more aggressive deportation policy than any previous president, returning more than 400,000 illegal immigrants to their native countries at the height of his administration's raids in 2012. Public outcry prompted Obama to prioritize convicted criminals in his second term. But by then, in 2011, former ICE director John Morton had already instructed employees to avoid "sensitive locations," including churches, schools and hospitals. Despite the aggressive enforcement under Obama, movement leaders viewed immigration reform as a viable goal. And so in the early days of the modern sanctuary movement, activists ultimately attempted to change policies, simultaneously seeking reform while honoring some church members' concerns for increased border security. At the time, the movement consisted primarily of churches with mostly white congregations and struggled to get immigrant involvement, according to Grace Yukich, a sociologist at Quinnipiac University who has studied the early days of the movement. Then Congress failed to pass reform measures. "Even though they didn't achieve some of the goals they had at the time, those social networks enabled what's happening now," said Yukich. Over the last three years, the sanctuary movement has grown greatly. In 2014, it had attracted 250 congregations, including synagogues. Following raids in January 2016, the number climbed to 400 congregations, according to Rev. Noel Anderson of the World Church Movement, which works with and tracks the U.S. sanctuary movement. By November, the number of churches involved had doubled to roughly 800 congregations, Anderson said. The total number of undocumented immigrants currently in sanctuary is unknown, in part because of the desire of undocumented immigrants and houses of worship to keep the cases private. A handful of cases have been well-publicized, however, including in Philadelphia, Chicago, Texas, Arizona and now Denver, where Vizguerra is one of two staying in houses of worship. "We consider it part of our religious freedom," Anderson said. "It's a prophetic platform to lift up the stories and hear a human side of people who are facing deportation." Legally, sanctuary churches are not likely protected under the First Amendment, said Charles Haynes, vice president of the Religious Freedom Center at the Newseum, since the government would likely claim a compelling state interest. Courts, he said, have varied in their interpretations over whether the act of providing sanctuary should be considered harboring or concealment. In 1986 a group of activists tied to a church in Arizona were tried and convicted of conspiracy in a case involving smuggling undocumented immigrants. Criticisms of the movement range from people who consider sanctuary a costly and ultimately ineffective way to help undocumented immigrants to those who say the religious leaders are encouraging illegal activity. Haynes noted that civil disobedience, especially among religious people, has been the key to success of almost every significant social movement in American history from abolition to suffrage to civil rights. "For many religious people, protecting undocumented people is a matter of conscience – and they are willing to go to jail to live out this conviction," he said. Even so, the turn the movement will take feels very uncertain under Trump, Salvatierra said. The Department of Homeland Security still lists churches as sensitive locations on its website, but some worry whether ICE will adhere to the policy under Trump. However morally compelling it may seem to some as a statement of civil disobedience, sheltering undocumented immigrants can also be costly, both financially and emotionally, especially if it is open-ended. And if there is no hope for reform, where will it end? "When we started, we had hopes that the sanctuary movement would change hearts and minds and pass immigration reform," Salvatierra said. "We took people into sanctuary without an exit strategy because immigration reform was our exit strategy." While still heeding the religious call to offer refuge, Salvatierra said churches may need to turn increasingly toward helping undocumented immigrants snared by ICE to pay for legal help. While they were living in Mexico City, Vizguerra said her husband was threatened at gunpoint three times by criminals while he was driving a bus, so he decided to move to live with his relatives in the U.S. He arrived in Sept. 1997. Next, Vizguerra attempted to cross the border with her family. She was detained while her 7-year-old daughter continued on with friends. She finally made it across and joined her husband and daughter on Christmas Day in 1997. She and her husband had three more children in the U.S., bought a house and ran a cleaning company. Shortly after she moved here, Vizguerra became an organizer for Service Employees International Union, a large labor union, and for Rights for All People, an immigrant-rights advocacy organization. On Jan. 20, 2009, the day of Obama's first inauguration, she was pulled over in a traffic violation. She was then detained, convicted of possessing a forged document and served 23 days in jail. She said she had used her birth date to create a Social Security card to apply for a part-time job. "The poor treatment that they give you as an immigrant, the lack of medical attention and the (jail custodians) treat you like you are trash. People are so afraid of talking about this," she said. "They think that if they talk or tell, their cases will worsen." Vizguerra acknowledged that she broke the law but she contends the punishment — separating her from her children through deportation — is too harsh. That arrest eventually led to an order of deportation in 2011. 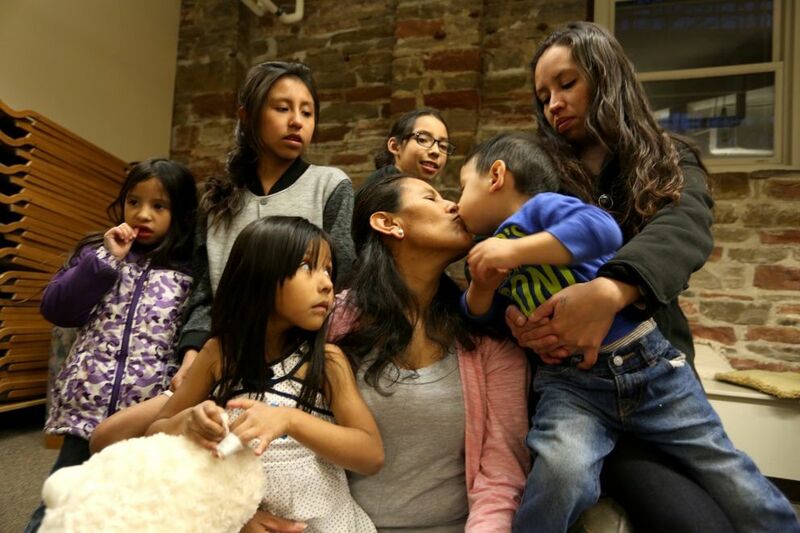 The court ruled that though her deportation would cause hardship for her children, it would not rise to the level of "exceptional and extremely unusual hardship," said her lawyer, Hans Meyer. That same year, ICE had been instructed to focus on those who posed a national security risk, recent illegal entrants and fugitives, and she appealed her case. During her appeals process, Vizguerra said she learned that her mother was dying of cancer. In an attempt to see her before her death, Vizguerra left for Mexico. But before she arrived, her mother died of complications and Vizguerra's appeal process ended because she had left the country. She returned to the U.S. on foot and was arrested and detained in El Paso, Texas, before she was eventually transferred to Denver. Later that summer in 2013, she was granted a 5-month stay of deportation and has received four extensions. On Dec. 5, her lawyer requested another stay while she waits to hear whether she could be granted a U Visa since she is a victim of domestic abuse. In 2011, ICE began urging discretion for victims of domestic violence. Vizguerra was reluctant to talk about her abuse in details, saying that it happened once. Court records show that her husband was charged and convicted of assault in 1999. In 2015, Vizguerra gave her testimony to the police, who then signed a certification for a U Visa, which would waive her removal order and give her a three-year visa. Attempts to reach her husband, whom she separated from last year, were unsuccessful. The two, she said, are on friendly terms and her kids stay with him during the week and with her on the weekend. She's received letters of support from federal, state and local officials, and Democratic Rep. Jared Polis has introduced a bill to grant her permanent residency. Her Dec. 5, 2016 request for a stay cites her health – she was diagnosed with gastritis in October – and her family. In November, a therapist wrote that her 10-year-old son Roberto was afraid Trump would deport his mother. "Client was visibly sad and anxious," the therapist wrote. Vizguerra herself was an early activist in the sanctuary movement in Denver through the Quaker-based American Friends Service Committee. When Vizguerra's first stay was about to expire in 2013, the First Unitarian Society of Denver was approached by the group to become a sanctuary church. The 400-member congregation voted overwhelmingly to do it, its pastor Rev. Mike Morran said. After her deportation was stayed, Vizguerra helped the church prepare the room for an undocumented immigrant named Arturo Hernandez Garcia, who lived there for nine months until he received a stay in 2015. Now it's Vizguerra's turn. Because the church has made a practice of publicly announcing to ICE its intentions to host an undocumented immigrant, Morran said he was told by a consulting lawyer that the church is not acting against the law. Morran, who has been pastor of the church for 15 years, said that he welcomes the possible opportunity to be challenged under the law. "Of course we can't house 11 million people, but we can articulate this as a pastoral necessity for the health of our larger communities," he said. "We are called as people of faith to welcome strangers. We are called to oppose the systems that oppress people." On Tuesday, Vizguerra drove for the last time, choosing a burrito from Chipotle as her last meal out. She spent the evening with her children and grandchildren who brought her roses for Valentine's Day. Vizguerra has a dresser drawer for each child and a coloring book and crayons for them for when their father brings them to visit. Luna, 12, said she doesn't like the attention her mother's case draws. "I'm one of those people who keeps things to myself," she said. "People ask, 'Where's your mom?' and I can't say." But her mother's case has always been a part of their life, she said, and now she was waiting to see what would happen. "I'm a little nervous because ICE might be mad that she's not going to the meeting," she said. Vizguerra said she has pains in her stomach and head and she barely sleeps. She did not expect another stay, but would ICE agents raid the church to deport her? Anything seems possible now. "I have to come to grips with the next four years of maybe being here," she said. The church has provided Vizguerra with some basic needs, including a microwave, cleaning supplies and a small heater. She has hung a rosary on the wall and set up a picture of the Virgin Mary atop a table. Although she was raised Catholic, Vizguerra said she no longer attends church regularly. Reflecting Vizguerra's longtime work as an activist, handmade signs were propped up behind the door to her new bedroom. "Mantega a las familias unidas," says one. Keep families together.